Read also: What Was Sailor Moon's Original Title? Read also: Was Sailor Moon Inspired by She-Ra: Princess of Power? ← What is a Tomoe and Its Connection to Saturn / Hotaru? Something to consider regarding the “sickle of silence” translation is that Saturn, the Titan of Roman mythology (or Kronos on the Greek) was an agricultural deity strongly associated with the sickle – he used his sickle, provided by his mother Terra, to cut his father Uranus into pieces. That’s a good point, and definitely worth considering! The weapon always seems to me a glaive. 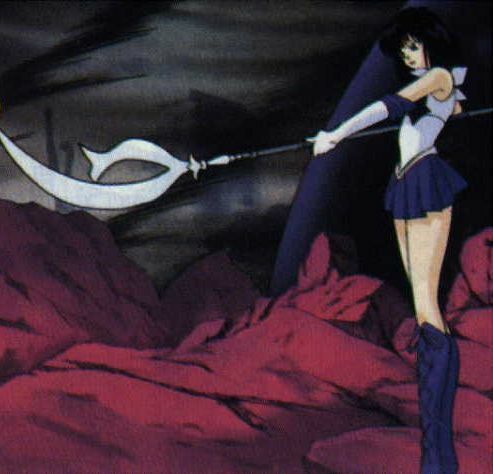 Saturn representing the death of all, the senshi that never be awake. The Glaive is always in every modern rappresentation of the Death itself.